Activists on the front line of this fight have used the word “protectors,” not “protesters,” to describe themselves. That’s because the land and water they are fighting for is of the utmost spiritual, cultural, and environmental significance. This land represents the sacred burial grounds of ancestors, historic village grounds, and Sundance sites. The water of the Missouri River is essential to life itself, not only for the Standing Rock Sioux Nation but for the many other Native Nations upstream and downstream as well. To desecrate these sites without so much as an adequate consultation with Indigenous nations or a full environmental impact assessment is both highly disturbing, and possibly illegal. Not only is Dakota Access attempting to force through a project that would destroy sacred ground, it has turned to violence and disregarded the voices of the Native community. Dakota Access security personnel have actually attacked peaceful protesters with dogs and pepper spray, reminiscent of horrific scenes during the civil-rights movement. North Dakota’s governor has since called in the National Guard in an obvious attempt to intimidate and discourage protesters. 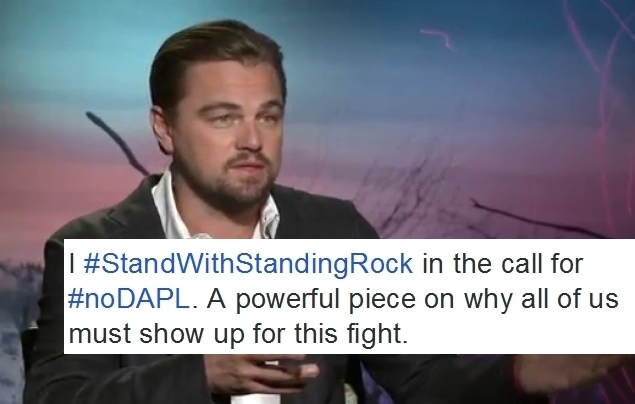 Responses to "Leonardo DiCaprio: I Stand With Standing Rock in the call for noDAPL"